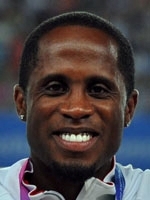 Quadruple world champion (2003, 2005, 2009, 2011), long jumper Dwight Phillips has set up one last big date at London as the soon to be 35-year-old goes in search of a second Olympic gold to go with the one he won at Athens. The American would seem to still be in possession of the powers to clinch his last big prize having recorded the world's second best performance in 2011 with a leap of 8.45m, behind Australia's Mitchell Watt (8.54m). But this is something of a comeback for Phillips. Having won his first two world crowns Phillips dropped out of sight after been blighted with nagging injuries (abdominal swellings and crossed knee ligaments). But he was back with a bang at the Berlin worlds of 2009 having dropped 12 kilos. It would have been doubly satisfying to clinch gold with a personal record of 8.74m. In fact it was the longest jump since the world record set by his compatriot Mike Powell (8.95m at the 1991 worlds). His fight back to the top of the pile was guided by fitness trainer Loren Seagrave, who took charge of him in 2008 working out of the University of Marietta, in Georgia. Seagrave told Phillips right off the bat - "Fat don't fly" - and put him on a strict diet after he had failed to qualify for the Beijing Games. He also got Phillips to improve his build up and lift off. Things soon started to look up and in 2009 he not only enjoyed an injury free year, but also improved on his personal best 100m time to 10.06sec. The following season he established and held the world's best performance at 8.46m before heading off to South Korea where he successfully defended his world title by leaping 8.45m at Daegu. This had been Philips' second comeback after he was knocked over my a motorbike as a teenager, breaking both legs and spending long months of intensive care and two years of physio. Making a three year lay off to his formative athletic experiences. He began as a sprinter and switched to triple-jump before finally realizing his best bet was the long-jump. He qualified for the Sydney 2000 Games at 23-years-old and came 8th with a leap of just 8.06m. Hard work was paying dividends though and before he went to Athens for his second Games he had already won the world indoor and outdoor championships at Birmingham and in Paris. These titles were to be the first of a long series. He's still dreaming of beating Powell's record, but a medal at London would certainly ease the pain if that feat is a stretch too far.